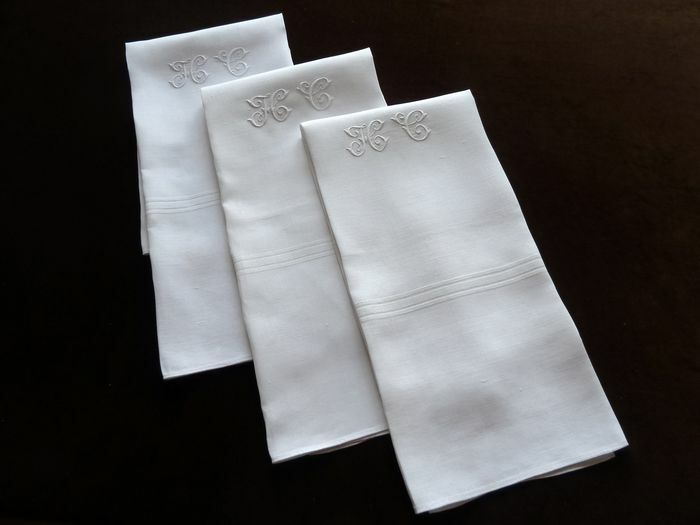 An ultra refined set of three guest hand towels with a beautifully embroidered monogram, "HC." These elegant towels, loomed of the finest quality of tightly woven, supple and and silken pure white "fil de lin" linen originally served either as hand towels or possibly as "essuie-verres," the fine towels that were reserved for drying silver and crystal. Three raised bands in the weave run the length of either side of each towel and the only other decorative element is the monogram, exquisitely embroidered in a fancy script and an important relief of bourdon. The hems at either extremity are finished by hand with miniscule stitches. Likely dating from the late 19th century, these handsome towels are in impeccable condition. OF NOTE: Two additional identical towels are available upon request. Dimensions: 33 x 25in.